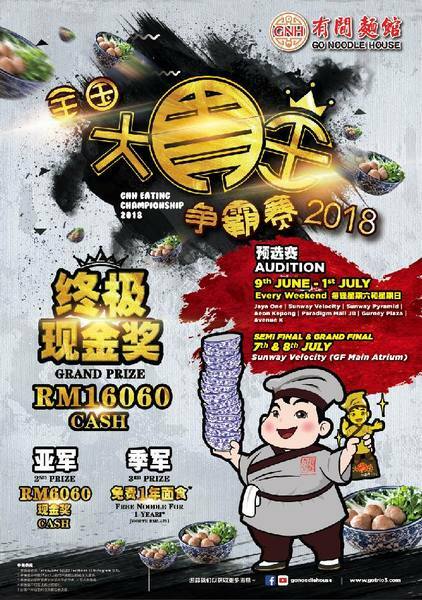 Eat and win RM 16060 CASH and FREE GNH NOODLES FOR 1 YEAR !!!! 1. Walk in any of the 7 selected outlets as above to participate during any weekend in the audition period. 2. Contestants must finish a regular bowl of Superior Soup Bursting Meat Ball Mixian* within 4 min 30 sec. 3. Failing to do so, contestants are required to pay for the bowl of noodles [RM 11.10 ]. 4. Top 5 contestants from each outlet who can finish the noodles within the shortest time will be eligible to enter semi final. (Audition Outlets) : Jaya One, Sunway Velocity, Avenue K, Sunway Pyramid, Aeon Kepong, Paradigm Mall JB, Gurney Plaza. (GRAND PRIZE) - RM 16060 CASH! (2ND PRIZE) - RM 6060 CASH!